Square Groove 2 architrave is by far and away the most popular modern profile in our range. It is a very tidy, uncluttered design that is a great way to finish off a modern or minimalist interior. 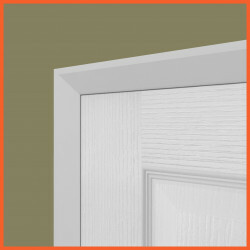 An excellent feature of the square groove 2 profile is that the grooves can be mitred in with matching skirting to create a continuous double groove from the skirting, all around the door. This can be made to work regardless of the width you choose to install. Height: The Square Groove 2 Architrave is available in 50mm, 60mm, 70mm, 80mm and 95mm heights as standard. 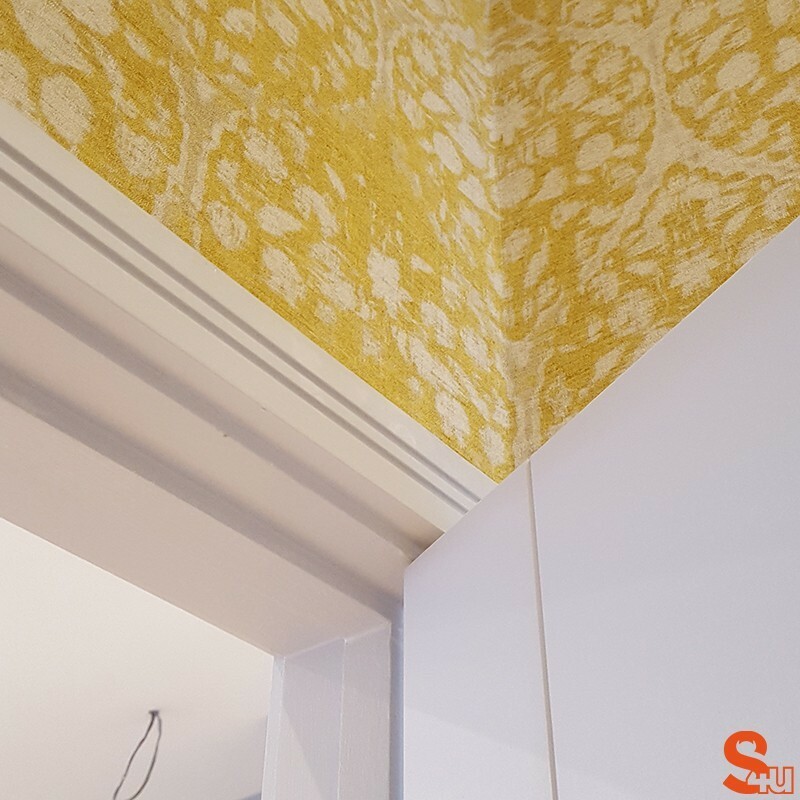 We can cut the architrave to any height above 50mm, so if there is a specific size you need let us know and we can manufacture it for you. The profile detail remains the same size regardless of the height you choose- as the height increases, so does the size of the ‘flat’ section beneath the detail. Lengths: The Square Groove 2 Architrave is available in 2440mm, 3050mm and 4200mm lengths. A standard aperture for a door in the UK is approximately 1980mm high by 762mm wide. The architrave is therefore slightly bigger, and depending on the width you choose the dimensions you will cut to will be in the region of 2100mm x 900mm. Once you have your exact measurements, you may find that different lengths of architrave lend themselves to different parts of the door surround. For example, a 4200mm length may be suitable to create 2 upright pieces, or even 4 ‘header’ or ‘crossbar’ pieces. Likewise, a 3050mm length has the potential to be used as both an upright and a crossbar. 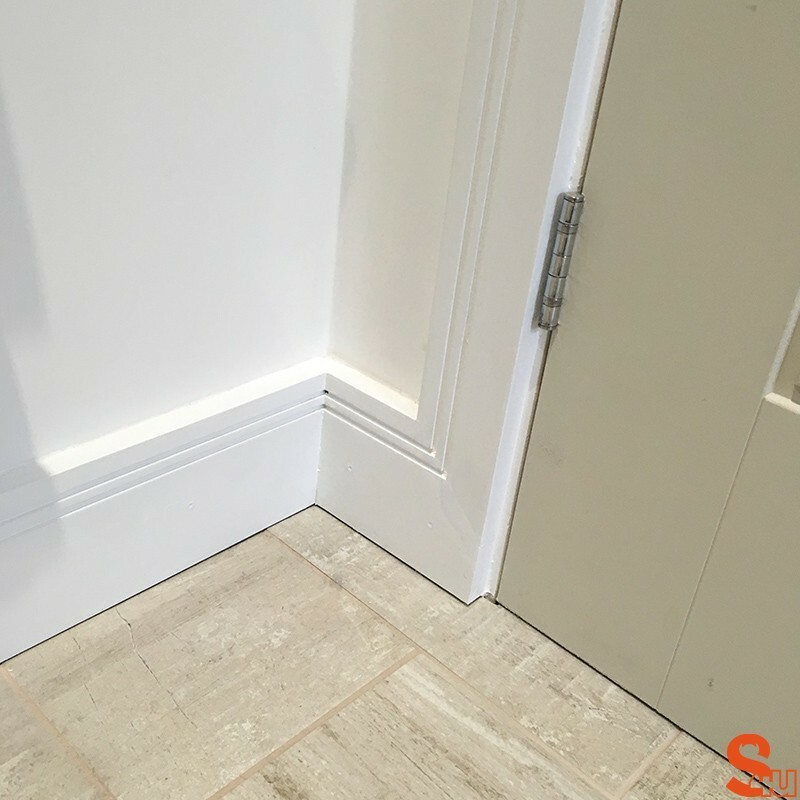 It is essential to ensure your measurements are correct before you cut any architrave lengths to size, as leaving the lengths too short can be very problematic and costly. Depths: The Square Groove 2 Architrave is available in 15mm, 18mm, 25mm, and 30mm depths. The overall look you are trying to achieve will determine which thickness of architrave is most appropriate for your project. 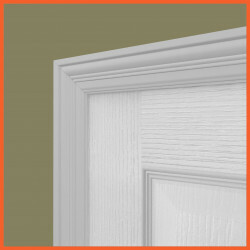 Traditionally the architrave you select would be slightly thicker than your skirting board. The reason for this is to mask any discrepancies in the wall on which the architrave is being fitted. The thick architrave creates an obvious step between it and your skirting board to act as an elegant transition between the two. 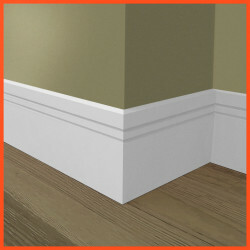 Alternatively, you can have your architrave and skirting board at the same thickness and run them together flush, or incorporate a plinth block at the base of the architrave where it joins the skirting to mask the transition smoothly. We offer Square Groove 2 Architrave in ‘sets’ for convenience and value for money. Each door set provides enough architrave to frame a single door on one complete side, with ample excess to ensure that you will definitely have enough material to complete the job. The major advantage of ordering door sets as opposed to individual lengths is that the charge for priming and finishing is the same for an entire set as it is for an individual length- making ordering sets a very cost effective solution, particularly on larger orders. 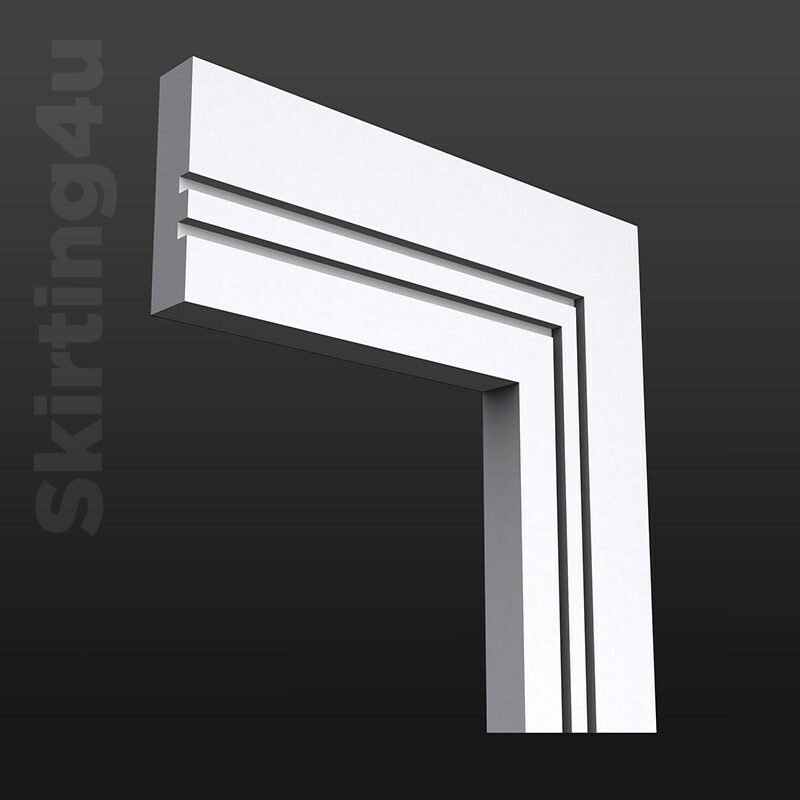 Single Door Set: 2 x 2440mm Lengths & 1 x 1220mm Length, to surround a single-width door face. Double Door Set: 3 x 2440mm Lengths to surround one double-width door face. Unprimed (No Finish): Choose unprimed to receive the Square Groove 2 Architrave as it comes in raw MDF with no primer or paint applied. The architrave will need to be primed before painting to stop the MDF from ‘furring up’ and causing a poor, uneven finish. Primed: For an additional £3.50 + VAT per length, we will supply your Square Groove 2 Architrave pre-primed and ready for you to apply a final top coat of paint to finish. The surface of the architrave is sanded to create a smooth surface before being spray coated in white pre-cat cellulose primer. Once dry, the architrave is sanded to remove any excess paint in readiness for the application of a second coat. The architrave is then sanded again prior to dispatch to ensure that it is ready for painting once delivered. 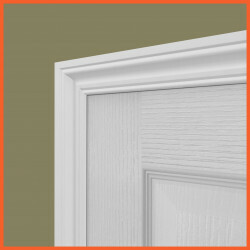 Fully Finished (Pre-Painted): We can supply Square Groove 2 Architrave fully finished in white satin or gloss paint. 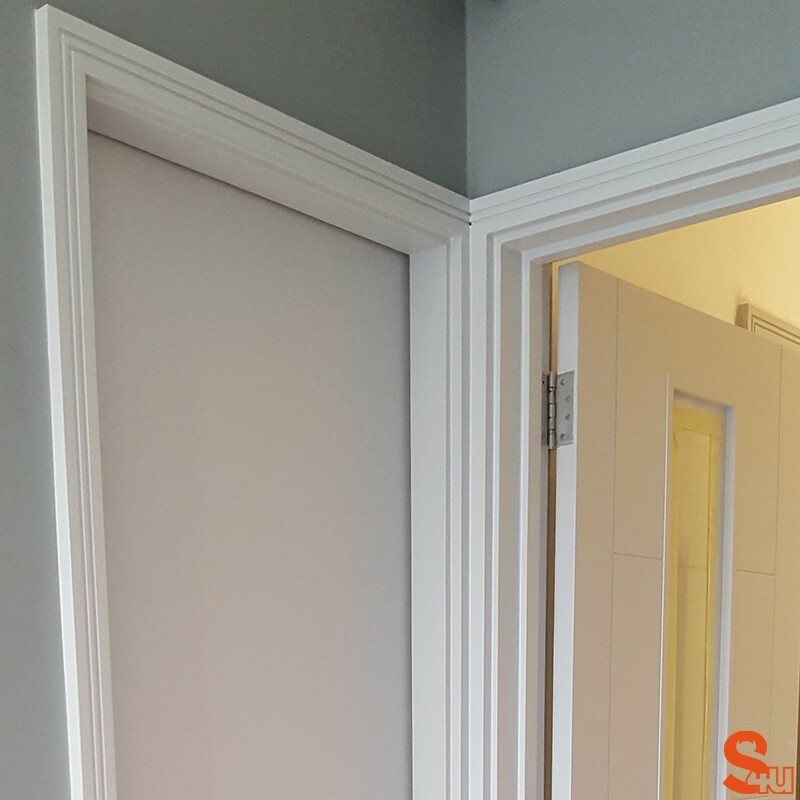 This is hand-sprayed on to the architrave by one of our in-house paint technicians to achieve a super high-quality finish. The architrave will require no further painting as it arrives ready to install. Depending on how you install the boards, you may find that you need to apply some touch up paint if the surface has chipped or scratched during the installation process. We can supply small pots of touch up paint if required, but the colour of the paint we use matches the standard brilliant white satin or gloss found at most major DIY retailers for convenience.